You are here: Home / Parenting Blog at KidsAintCheap / Money and Finances / Living On Very Little Income? Here Are Some Basic Considerations. 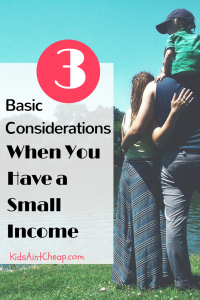 Living On Very Little Income? Here Are Some Basic Considerations. As a trained financial coach and someone who has experienced life below the poverty line, I’m passionate about helping people who find themselves living on very little income. I want them to know there’s more hope than they realize. It’s not easy, but there are steps people can take today to improve their financial situation at home. Let’s go over a few of those basic considerations now. What you earn annually does not directly affect your living situation. For example, things like cost of living, recurring bills, spending habits, and hobbies make a huge difference. Some families can make do on $25,000, others struggle with $125,000. The key component that made the biggest difference in my own life wasn’t my bank account balance, it was my behavior. When my mindset shifted toward healthier habits, the numbers inevitably followed. Here are a few key behavioral shifts I made that improved our finances when money was especially tight. nsus Bureau, the poverty line for a family of four is $24,339. View your family’s size and threshold here. You may experience creditors calling you about a bill that’s overdue, what’s that when your family is still able to eat and there’s no eviction notice on your door? Protecting the four walls, no matter your income, puts you in a completely different place emotionally. If you feel like you’re one broken appliance away from a crisis due to your limited income, it’s time to save up for emergencies. It’s so easy to say you can’t spare an extra $500 right now to just sit in the bank, you wouldn’t be alone in that thinking. Over 62% of people responded in a recent Bankrate poll that they wouldn’t be able to cover an unexpected expense like a $500 car repair or a $1,000 trip to the ER. But remember, we’re looking at modifying behavior. You can walk a different path than the majority. For example, how would it feel if your radiator cracked and white smoke started billowing out of your hood tomorrow? Now how would it feel if you knew there was money in the bank to fix it immediately? You’ve just reduced a crisis to a problem with a solution. Create a budget and educate yourself on your current spending habits. Cut back in areas of excess and drop that extra cash into an emergency fund. For free printable or downloadable budget forms, click here. Set up an automated savings transfer every month to make sure the habit sticks. Sell items around your house on Facebook or in a garage sale. Got a stack of books lying around? Try selling them on Amazon or Bookscouter.com. Eliminate as much debt as possible. This will free up more and more money each month to put toward savings and living expenses. If you’ve protected your four walls, started planning ahead for emergencies, and created a budget to track your spending, then congratulations. You’re light-years ahead of so many Americans who carry the stress and worry of finances on their shoulders day in and day out. Pick up a second job. Increase your hours or work overtime. Seek a promotion or raise. Start a side hustle from home. Seek out a higher-paying job. You have the same 24 hours as everyone else, so getting a second job or working longer hours comes with the sacrifice of time away from home. If that’s what it takes to protect your four walls and set up a buffer against emergencies, then that might be the right answer for the time being. 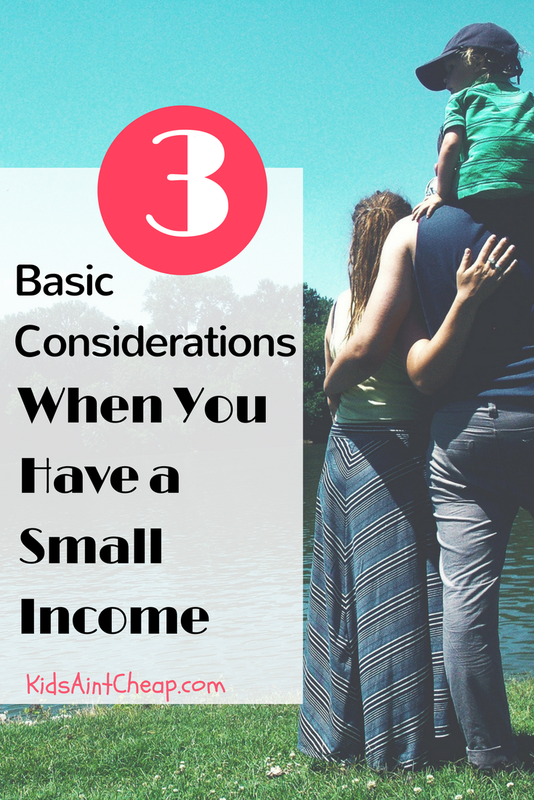 If you’re living on very little income, this is probably a difficult season for you. Change won’t happen overnight, but if you build a financial foundation based on your values (i.e. protecting your family), then each decision will flow out of that and sacrifices like cutting up a credit card or eating out less will sting less. The trade off will eventually be a more peaceful home and greater financial freedom. Have you ever experienced living on very little income? What steps did you take to improve your finances? Do you dream of becoming a stay-at-home mom? We’ve assembled a collection of resources just for you!